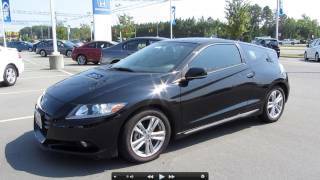 Honda CR-Z Sport Hybrid Coupe 2011 made its US Production debut at the Detroit Auto Show 2010. CR-Z Sport Hybrid Coupe, available later this summer in the U.S., introduces sleek styling and sporty handling to the hybrid segment while maximizing style and fun in addition to efficiency and economy. CR-Z Sport Hybrid Coupe is powered by a 1.5-liter i-VTEC engine with Honda's compact and lightweight Integrated Motor Assist (IMA) hybrid-electric system. The two-passenger Honda CRZ introduces a new three-mode drive system that allows the driver to select between Sport, Econ (Economy) and Normal driving modes. The all-new 2011 Honda CR-Z sport hybrid coupe, making its U.S. production debut at the North American International Auto Show in Detroit, introduces sleek styling and sporty handling to the hybrid segment, American Honda Motor Co., Inc., announced today. "The CR-Z is a personal sport hybrid coupe for people with a spirit of adventure and an elevated sense of responsibility toward the environment," said John Mendel, executive vice president of sales for American Honda. "It's the first hybrid designed to maximize style and fun, in addition to efficiency and economy." Set to go on sale late summer in the U.S., the CR-Z is powered by a 1.5-liter i-VTEC engine with Honda's compact and lightweight Integrated Motor Assist (IMA) hybrid-electric system. The two-passenger CR-Z introduces a new three-mode drive system that allows the driver to select between Sport, Econ (Economy) and Normal driving modes. The exterior's distinctive "one-motion" wedge form originates from its low-slung hood to form a broad forward stance. A side profile with a deeply inset beltline conveys a dynamic tension, while the short wheelbase and large, wide front grille accents the vehicle's athletic presence. The futuristically styled interior offers a high-tech appearance and ergonomically intuitive controls. Instrument panel meters illuminate with a three-dimensional, vibrant blue color theme resulting in a multi-layered appearance. Set against a motif of textured black materials and aluminum-style trim accents, the upper portion of the dashboard extends toward the driver to provide a wrap-around cockpit environment. The passenger zone offers an open, comfortable space. Premium sport-oriented cloth seats are designed to provide excellent lateral support along with everyday driving comfort. A mid-ship console behind the front seats optimizes cargo space. A hard-shell separator can be closed to create additional hidden storage. The two trim levels include the well-equipped CR-Z and the feature-rich CR-Z EX. A six-speed manual transmission is standard equipment and a Continuously Variable Transmission (CVT) is available. Standard features on the CR-Z include Vehicle Stability Assist, an AM/FM/CD/USB audio system with six speakers, automatic climate control, power windows and door locks, remote entry, cruise control, and more. The CR-Z EX adds, High-Intensity Discharge (HID) Headlights with Auto-On/Off, fog lights, a 360-Watt AM/FM/CD premium audio system with seven speakers including subwoofer, Bluetooth® HandsFreeLink®, perforated leather-wrapped steering wheel, and more. 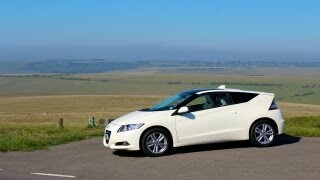 The CR-Z EX is available with the Honda Satellite-Linked Navigation System1 with voice recognition. The CR-Z represents the sixth unique version of Honda's original IMA technology since the launch of the 2000 Insight, the first hybrid vehicle available in North America in December 1999. The foundation of the CR-Z's hybrid powertrain is a 4-cylinder, 16-valve, single overhead cam engine with "intelligent" Variable Valve Timing and Lift Electronic Control (i-VTEC) that receives additional power from the IMA system's DC brushless electric motor. The i-VTEC system controls the opening and closing of one intake valve per cylinder to enhance combustion at low RPMs. The 10-kilowatt electric motor assists in acceleration and also acts as a generator during braking or coasting to capture kinetic energy that recharges the 100-volt IMA nickel-metal hydride battery pack. The gasoline engine can automatically turn off during vehicle stops to improve efficiency. The system delivers a combined peak output of 122 horsepower2 at 6,000 rpm and 128 lb-ft. of torque2 at 1,000 to 1,500 rpm (123 lb-ft on CVT-equipped models). Preliminary fuel economy estimates are anticipated to result in a rating of 36 city/38 highway miles per gallon3 on CVT-equipped models. Manual transmission models are anticipated to achieve an EPA-estimated fuel economy rating of 31 city/37 highway miles per gallon3. The CR-Z is rated as an Advanced Technology Partial Zero Emissions Vehicle (AT-PZEV) in states that adhere to California Air Resource Board (CARB) ZEV standards (EPA Tier 2, Bin 2 in all states). The standard six-speed manual transmission is engineered for optimal acceleration performance in gears one through five and for optimal fuel economy in sixth gear. When starting on steep inclines from a stop, hill start assist temporarily prevents the vehicle from rolling backwards during the moment between releasing the brake, depressing the throttle and releasing the clutch (for a duration of approximately 1.5 seconds). The available CVT provides the convenience of an automatic transmission with a seamless transition between minimum and maximum ratios, while also keeping the engine within an optimal RPM range for overall efficiency. To increase the performance potential of the CVT, paddle shifters located on the steering wheel allow the driver to manually simulate the stepped holding pattern. In Sport mode, the paddle shifters will hold and maintain a selected ratio. The CR-Z's three-mode drive system allows the driver to select between individual modes of performance for Sport, Normal and Economy driving styles. The system is activated via three backlit buttons to the left of the steering wheel. The Sport mode enhances multiple vehicle systems for performance including the engine throttle responsiveness, electric power steering effort and the electric motor power assist. The inner ring of the tachometer illuminates red when the vehicle is in Sport mode. During Econ mode operation, the engine's responsiveness is tuned for optimal economy, the electric motor assist gives priority to fuel efficiency and the air conditioning system can reduce its overall load on the engine. The inner ring of the tachometer transitions between blue and green when the vehicle is in Econ mode, with the green representing more ecological driving. Normal mode provides standard settings for steering, engine response, motor assist and air conditioning. Similar to Econ mode, the tachometer ring transitions between blue and green when the vehicle is in normal mode, with the green representing more ecological driving. Like the Honda Insight, the CR-Z offers an Eco Guide and Eco scoring feature to help drivers track progress of efficient driving styles. The front MacPherson strut suspension and rear H-shaped torsion beam suspension settings are tuned to provide a sporty, solid and dynamic driving experience. All models are equipped with 16x6-inch aluminum wheels with 195/55 R16 86V tires. Accessory 17x7 alloy wheels with 205/45R17 84V tires with are available. The standard anti-lock braking system (ABS) with electronic brake distribution (EBD) uses ventilated front discs and solid rear discs. The low vehicle height and placement of the battery and other hybrid components beneath the rear cargo area further contribute to a low center of gravity, which is key to the new CR-Z's responsive, sporty handling. Electric power-assisted rack-and-pinion steering enhances steering performance and improves efficiency. In addition to being environmentally responsible, the CR-Z demonstrates a commitment to safety in its design and construction. The Advanced Compatibility Engineering™ (ACE™) body structure helps protect vehicle occupants in a frontal collision. Additional safety technologies include standard dual-stage, multiple-threshold front airbags; standard front-side airbags with passenger-side Occupant Position Detection System (OPDS); side-curtain airbags, active head restraints; an anti-lock braking system; a tire pressure monitoring system; and a pedestrian injury mitigation design in the front of the vehicle.